It is said that if you ask the question “where does our food come from?” today you’ll get the answer “the supermarket” more often than not and it’s true that many people are increasingly further along the supply chain from the raw produce than ever before – I am guilty of this myself, for convenience’s sake I eat much frozen and processed foods and it would be easy to not realise which animal beef comes from or that potatoes are grown in the ground or peas are pulled from one natural packet before being shoved into an artificial one. The thing is that so much of our food still relies on nature to help in its production, despite irrigation systems, spray-on pesticides and nutrients. Sometimes an apparently insignificant change in nature can have catastrophic implications that science can’t (yet) get round effectively – the most extreme example of this effect on our food being the novel The Death of Grass by John Christopher in which a devastating plant virus wipes out all species of grasses – including wheat leaving us without cereal crops for either us or our livestock to eat with the result of a rapid breakdown of society to a barbarous state of desperation for survival. But it’s just science fiction isn’t it, we’re ok. Aren’t we? Well, to a point. Bees are one of the main pollinators of plants, we need them in order to grow our food crops as well as gardens full of pretty flowers but they have been, across the world, in decline in recent years and scientists don’t fully know why. It is thought that if we lost the bees the knock on effect would be the loss of up to a third of our regular diet. Various theories have been put forward such as mites like the tracheal mites that killed off all native British bees during World War I – which needed to be replaced by imported Dutch and Italian bees. It is also theorised that, ironically, pesticides and other chemicals used to protect the crops the bees are pollinating are responsible. So what can be done? 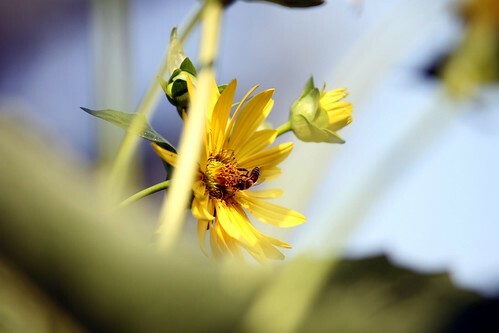 Well another possible contributing factor is that people are either removing wild flower areas that supported the bees or concreting over gardens and having low-maintenance patios and so on that have no flowers at all or only plants that are no use to bees whatsoever. So while science tries to find out why the decline is happening and the debate over pesticides rumbles on consider how that humble bee sitting on your windowsill ultimately affects your life, it’s not as insignificant as it may seem. There are lots of posts on Facebook at the moment advising helping out struggling bees with drops of sugar-water and more importantly the planting of bee-friendly plants. At the front of our factory is an area that hadn’t been cleared of wild plants and flowers for some time and as I was making a mug of tea the other day I noticed it was a hive of bee activity, so to speak, so we’re doing our bit, in a tiny way.